Why Install Epoxy Garage Flooring in Your Home? If you live in the greater Dallas, TX community, then you likely know someone who’s a car enthusiast. Whether they prefer to handle all of their oil changes and repairs themselves or they have a collectible car they love to show off, it seems as if everyone has a friend with the need for speed. When they invite you over to see their brand-new garage floors, it’s an impressive display. Hard, shining surfaces that look just like a professional showroom are looking back at you, dazzling underneath the fluorescent lights. Besides looking fantastic, you begin to wonder if you should install epoxy garage flooring in your home as well. However, you might not know enough about the application to make an informed decision. You can always reach out to Dallas Epoxy Pros for any questions you have, as well as affordable installations throughout the community. Below are some of the numerous benefits why you should have resin coatings for your garages. When your garage’s flooring is shinier than the vehicle parked on top, you can expect everyone to experience an audible “wow” moment when they come to see it. If you intend on selling your home in the future, that could become one of the primary selling points. Even if you only use your garage for storage, epoxy coating takes it from dull gray concrete to any number of colors, shades, and textures. Your installation can apply several different flakes and add-ins that take on different cosmetic properties. Whether you need to show your team spirit or want it to look like an upscale mechanic shop, the options are virtually limitless. Best of all, your new floors will maintain its appearance for years to come with little maintenance needs from you. They do sell epoxy flooring kits for those homeowners confident that they can take on the project. However, if you’re looking for lasting results, we recommend choosing a certified professional to handle it for you. If you’re like most homeowners, you likely have stacks of paint cans, gasoline containers, automotive supplies, and power tools stored in your garage. Or, perhaps you have a huge steel tool chest looming over everything else. Now imagine any one of those stored items coming crashing down onto the garage floor. If you’re lucky, the only thing you’ll see is a small impact and some staining, although the damage is likely worse than that. 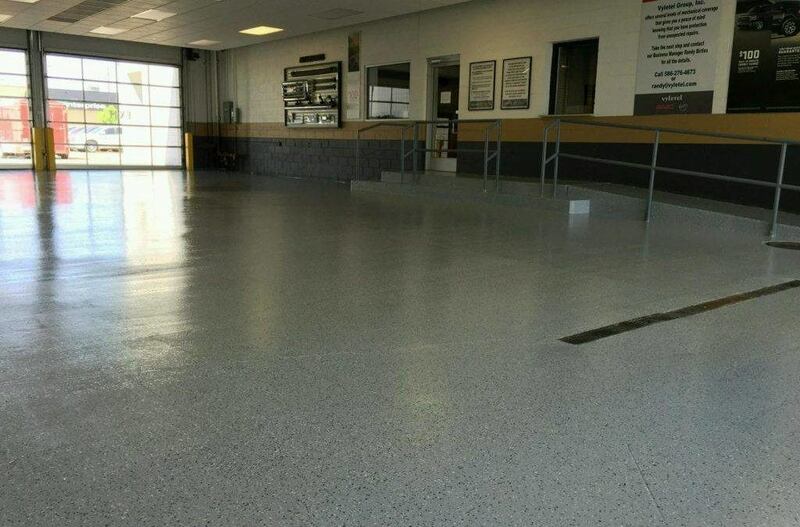 Epoxy floor coatings add a durable surface protector that holds up against more daily impact threats. It stays strong against daily use with vehicles, tools, machinery and more, keeping it shielded more efficiently than bare concrete. If you have already applied a few cement patches or rely heavily on adhesive fillers, then epoxy can help you avoid future frustrating repairs. In many cases, you can have it installed directly on top of the existing floor, saving you even more time and money. If you’re a mechanic, having an epoxy garage is vital. You convinced your friend to drive you to and from the airport so that you could leave your vehicle behind. You argue that it’s a lot safer and cheaper to stow it in your home’s garage rather than rely on airport security. However, once you come home, you find that your car leaked all over the garage’s floor while it wasn’t in use. And no matter what cleaner you scrub it with, the stain isn’t going anywhere. 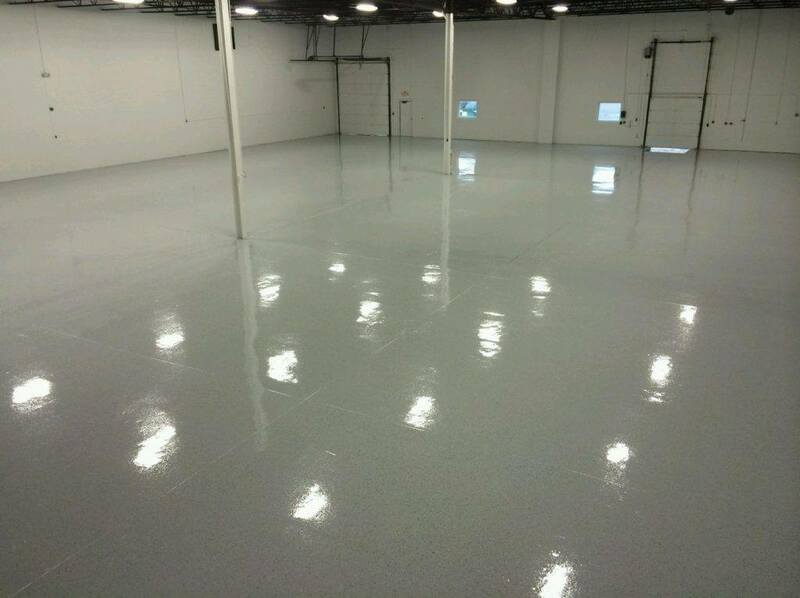 Epoxy garage floors repel more liquids than any other material type. That makes it the ideal choice for automotive leaks, machine oils, paints, and other sticky substances, preventing them from leaving stains behind. The slick surface coat makes more messes a breeze to clean, often with nothing more than a rag or mop. Cement, on the other hand, quickly stains, and may get etched away by the chemicals that spilled. The average ground temperature in the state hovers around 75 degrees. However, to get to that temperature, it starts off much colder at night and during the early morning. That leads to significant changes during the day, which does impact how comfortable the rest of your home remains. Not only that but as concrete reacts to changing from hot to cold, it causes stress and cracking. By coating over the porous topmost surface, you can seal in more heat from escaping from the ground. That produces an insulating effect, which allows you to enjoy a more consistent average temperature. If you frequently use your garage as a workshop or to keep a beverage refrigerator, you’ll undoubtedly want to keep a handle on how hot or cold the area gets. When standard cement makes it challenging to stay comfortable, you’ll wish you had an epoxy coating installed. You already know that the resin applied to your garage’s floor leads to better moisture and spill resistance. However, you’ll also enjoy a faster, simplified cleaning process when it’s time to maintain the area. Once it’s time for Spring Cleaning, you likely prefer to give your garage a once-over as well as the rest of your home. Unfortunately, because you probably rely on the soap, water, and either a hose or a pressure washer, it takes forever for the floor to dry. While you wait, everything you own is stacked out in your driveway. Unless you want people to think it’s a free yard sale, you’re stuck babysitting your stuff until you can put it all away. Epoxy garage floors clean fast and dry even more quickly. Whether you prefer a leaf blower or a garden hose, you’ll be amazed at how much sooner you get through your chore. It’s true that if you maintain your garage’s original concrete floor the way it requires, you may never have any issues. However, rapid changes in temperature, moisture, and impact damage all chip away at the surface. Some garages seem to take on more damage than others, or you might find that you are applying sealant and patches every year. One way to mitigate your maintenance and repair costs is by adding an epoxy coating to your surfaces. Epoxy flooring can last a lifetime when correctly cared for, and because it’s more resistant to many different hazards, it makes sense to install them. It is important to note that any maintenance should get completed every few years to ensure it continues working. Most of your necessary upkeep stays regular cleaning, and maybe some light crack sealings. The good news is that even patched epoxy lasts longer than concrete. Say that you purchased a home that already happens to be several decades old. By then, you have a ton of items to swap out, and the garage floor might be one of them. A concrete contractor will likely need to break down the existing surface, probably with a jackhammer, and spend hours preparing for the installation. Once it’s all framed and poured into place, he tells you to avoid walking on it for an entire month. While you could probably use it sooner, you do run the risk of creating structural problems. When you install epoxy floors, on the other hand, you can begin using them after a couple of days. 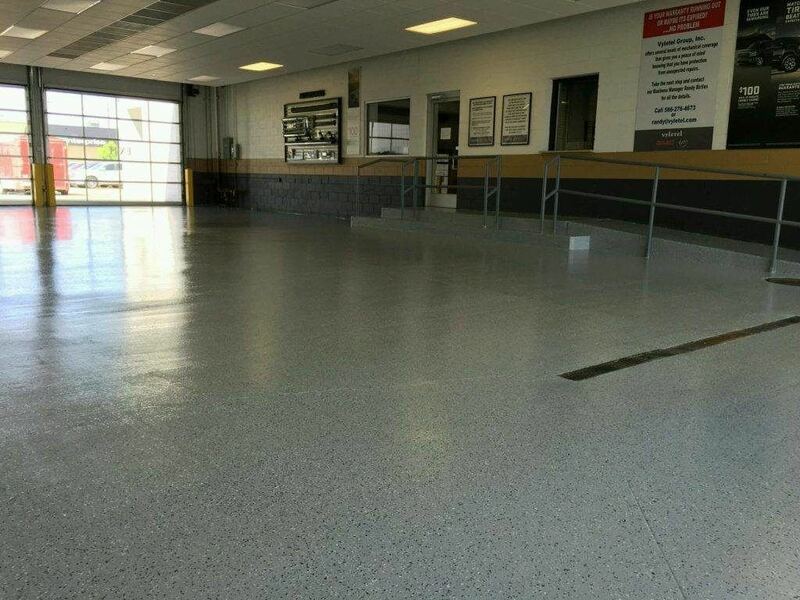 When you’re ready to start your upgrade, call Dallas Epoxy Pros for your garage. Or you can also check out the best epoxy flooring styles.